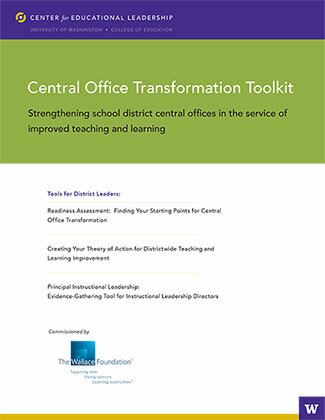 Commissioned by The Wallace Foundation, the Central Office Transformation Toolkit was developed by the Center for Educational Leadership in partnership with Dr. Meredith I. Honig, an associate professor at the University of Washington College of Education. The tools – Readiness Assessment, Creating Your Theory of Action, and Principal Instructional Leadership – are based on Dr. Honig’s research and CEL’s experience helping districts across the country improve how their central office leaders support better instructional leadership. This guide helps districts identify productive starting places for central office transformation. It guides central office staff through a series of questions to generate information to use in discussions with key district leaders and helps districts identify the first phases of the transformation process based on such considerations as ease or urgency. This tool helps districts ensure that their central office transformation plan is grounded in a clear analysis of what is working and not working for students. It helps identify how strengths and weaknesses in classroom teaching, principal instructional leadership, and central office practice, structures, and systems are contributing to students’ current performance. Using that analysis, districts will be able to generate a theory of action, or an evidence-based story, that explains the specific changes they intend to make. This tool helps instructional leadership directors (or principal supervisors) continuously assess principals’ instructional leadership, develop a clear sense of what counts as evidence for instructional leadership, and create systems for collecting and organizing evidence of principals’ instructional leadership. Using this evidence can be the foundation for principal supervisors’ work with individual principals and groups of principals.